I’ve been using a Nike+ Sportwatch for six weeks and 153km of running, since switching from a Garmin Forerunner 310 XT, which I’ve had for over two years. In this blog I am writing down how I have found it. I’ve also asked a colleague who has been a Nike user for three and a half years, for his view of the Nike+ system, which the Sportwatch uses to track your progress. The main reason for using the Nike+ device over the Garmin was that my old 310XT was taking ages to lock onto GPS. The Sportwatch is pretty fast at getting a GPS lock but it did seem to get my pace wrong occasionally. I’m not sure why, but the GPS signal outside our office is rubbish so I can only assume it didn’t lock onto the satellite properly. I also purchased the £15 footpod Nike+ pedometer and a little pouch for £5, which holds the pod in non Nike running shoes. Nike recommends using the footpod with the GPS for about half an hour to improve its accuracy – and the combination of footpod and GPS seems to work great and my pace seems to be recorded correctly now. Getting started on a run with the Sportwatch is a bit fiddly compared to the Garmin 310 XT, where the user simply pressed Start. On the Sportwatch you have to scroll down a menu and make sure either or both the GPS and the Footpod are ticked on. There has been a few occasions when GPS seemed to disable itself before I begun my run when I was outside, which is not great because I like seeing a map of my route. To configure and get the most out of the Sportwatch it has to be connected to the Nike+ website and you need to set up a free account. 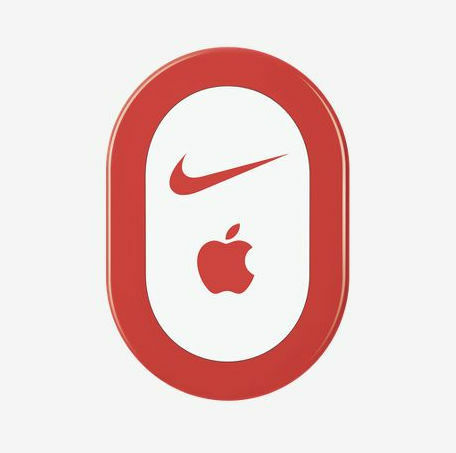 The Sportwatch plugs into a USB port on your computer and connects to the Nike+ website automatically after you have installed Nike’s driver software. Once connected to Nike+ it’s possible to configure which parameters the Sportwatch displays while running. I use average pace, and my Sportwatch will automatically scroll through other parameters like distance, elapsed time etc. You can also set auto pause for when you’re waiting to cross a road. Once you finish a run, you have to go into the menu and select the end run option. Again, this is not as easy as on the Garmin, but you get used to it. Unlike my old Garmin, where the watch communicated wirelessly with a Garmin Ant+ USB adapter on my computer, the Sportwatch needs to be plugged into a USB port to upload data to Nike+. The USB adapter folds into the watch buckle and Nike provides a USB extension cable. 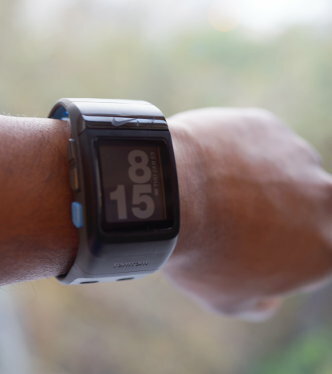 Personally I feel the USB connector on the Sportwatch is a bit fragile and I’m concerned that rinsing the watch could tarnish the USB contacts, which could impact its ability to connect to Nike+. 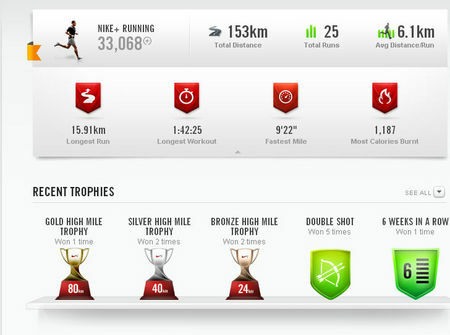 Like Garmin, Nike has a dashboard where you can see your runs and compare how you are doing. It doesn’t seem as sophisticated as Garmin’s Connect site. The brightly coloured bar graphs, animated playback of your run and trophy chest feel more like a computer game than a serious running aid. I think it would be hard to measure how my 5k pace has changed over a set period, or compare it to last year’s pace. This is something I have been able to do on Garmin’s alternative Connect dashboard with my old 310 XT. The more I use Nike+, the more I think the stats are nonsense. 1. The whole thing about comparing against men of your age is a bit false and probably a bit dangerous from a health perspective given that no one is average – weight, general health, fitness level and training objectives all need to be taken into account. 2. Average length of run (on Nike+) = average over a month or week (including the days you have off). For me it does not reflect that I tend to run two or more 8km runs + a long run (like 16 km) each week – ie Nike+ says my average is 6km over 7 days rather than 16+8+8/3=10km average per run. If I were being mean I’d say the Nike marketing people want you running every day so you wear out your shoes quicker! 3. 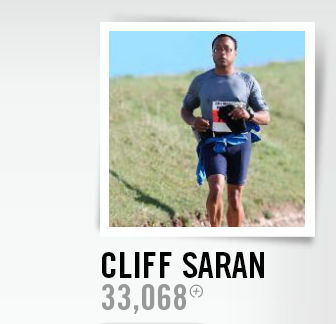 I’d like to compare how I run against people in the Nike+ community who have the same training objectives ie they are training for a marathon, but Nike+ only appears to let me see how I compare against people my age. Personally, I would find it really useful if Nike+ could take into account my last race time and training objective (I’m training for a marathon) to show me how much people with the same training goals are doing, their pace, the distance they run on average, and how many times they go out running. And if it also presented a dashboard where I could then dial down my marathon finishing time to see what level of training I needed – that would be perfect! Fellow runner Simon Quicke has been a Nike+ Sportband user for over three years. I asked him for some feedback as a long-term Nike+ user. This is quite a long review. Since I switched from a Garmin Forerunner, my expectations are a bit different to someone buying their first smartwatch. For balance I included the views of a long-term user. Both our experiences illustrate areas where Nike can make improvements. As a wearable device, the Sportwatch feels bulky, but it is similar in size to my old Garmin Forerunner 310 XT. It is functional and can reliably record run stats. My biggest concern, and this will be a challenge not just to Nike, but to other smartwatch makers, is that these devices live and die by the quality of the software. An unfortunately, neither myself nor Simon think the Nike+ back-end meet our expectations for a device whose main purpose is to measure fitness.